I’ve been reading Bruce Trigger’s Early Civilizations, which is a comparative study of Egypt, early Mesopotamia, Shang China, the Maya, the Aztecs, the Inkas, and the Yoruba. It’s a huge book and rather dry, so unfortunately I can’t say I read it all. But for conworlding purposes I thought I’d list some of the stuff that was new to me. He finds a significant difference between city-states (Mesopotamia, Maya, Aztecs, Yoruba) and territorial states (Egypt, China, Inkas). Both were governed by kings, were hierarchical, were divided into an elite and a peasantry with little social mobility. But territorial states are likely to have fewer cities (with peasants living in villages rather than the cities), government road systems, and long-distance trade run largely by the government. None of the civilizations really valued traders, and indeed often took steps (e.g. with sumptuary laws) to signal that they were not aristocrats. On the other hand, in some civilizations, lesser members of the aristocracy could supplement their income with trade. The position of women in all the civilizations was lower than the men, and tended to deteriorate over time. E.g. 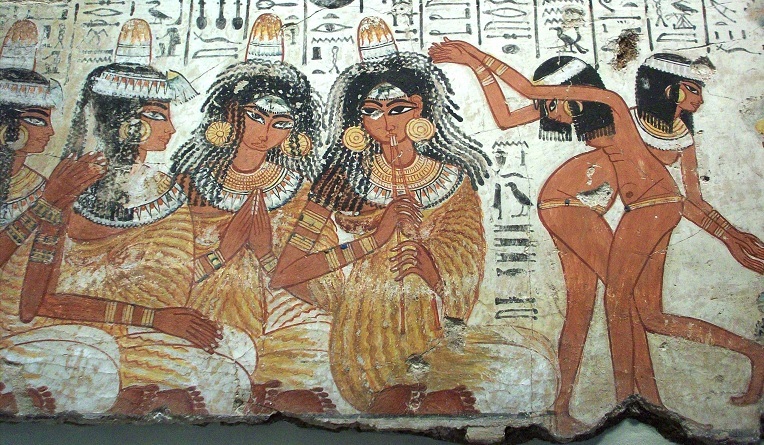 in earlier Egypt and Shang China we see female bureaucrats (often relatives of the king), later replaced by men. Traders among the Yoruba, and innkeepers in Mesopotamia, were often women. The idea of a straightforward practical manual on anything seems to have eluded the literate societies– what they wanted to write down was magic and rites. Even practical concerns, like metallurgy in Benin and navigation in China, were conducted with rituals and superstitions. The Tea Party view of the world– a 1% who cannot be coddled enough, the poor who need to be treated ever more badly– is as old as dirt. The social contract was always a rotten bargain. E.g. in China, there was ‘punishment’ (xing) for the lower classes, ‘etiquette’ (li) for the gentry. It was viewed as just and natural for the elite to live off the labor of the masses– and make sure the masses had no real avenues of improvement. When ordinary coercion wasn’t enough, it was always possible to invent even more pretexts for oppressing the poor, e.g. with accusations of witchcraft. Things like the admirable road system of the Inkas were not built as social services– they were for military movements and for provisioning the elite. About the one service the poor could count on was security: times of anarchy and disunion were even worse. At the same time, management was a very difficult problem for early states. No ruler could keep an eye on everything, and the elite was both a necessity and a threat. The elite had to be kept relatively happy, and it was the only source of people one could delegate authority to, but it also took all the independence it could get. In practice, totalitarian micromanagement was impossible– even conquered groups of people were generally left to rule themselves so long as they paid their taxes. The book is organized by topic, so you can compare (e.g.) class organization or cosmology across all seven societies. It’s very thorough, but he doesn’t have a gift for making it vivid (as e.g. Marvin Harris or John Fairbank do). The choice of civs is just a little odd– the Aztecs and Inka were hardly early; there were the culmination of a thousand years of development. He has some excuses for not including anything from India– I think he says we know too little about early civilization there– but if you’re going to include something as late as the Inka Empire, you could certainly include Asoka’s empire. My one immediate-buy AAA game this year was Arkham Origins. So, first of what will undoubtedly be many thoughts. You may have to turn down your graphics settings from Arkham City. Something is more intensive… tonight I finally got my framerate back up; I’m not even sure which setting it was. Overall: it feels like more Arkham City. Which is a good thing, because I think that was about the best game ever, and it’d be a pity to fall terribly short. The gameplay is about the same; the place looks about the same only darker; Batman is the same humorless driven dude. Now, what’s gone are Rocksteady (the developers of AC and Arkham Asylum), Paul Dini (the writer), Mark Hamill (previous Joker), Kevin Conroy (previous Batman)– all of which is a pity. The new Batman/Joker voices sound like people trying to match the old ones, rather than carving out a new performance space. Catwoman is missing too, which is a bigger hole– not only is it nice to get a break from Bats sometimes, but the game could use more of a female presence. Oracle and Talia are apparently gone too. I wondered what they’d do to top Arkham City, and the answer is: make the playable area roughly twice as large. It’s the area of the prison, plus a whole new set of neighborhoods to the south. (We still don’t get to go into the skyscraperland to the north.) There’s a “curfew” on, despite it being Christmas Eve, so the good citizens are all off the streets, making it feel like the thug-infested AC. Rather than carry on the story, it’s a prequel, so Batman is apparently new– the Penguin doesn’t at first even believe he exists. At the same time, it’s a sequel, so Bats pretty much has all his gadgets and abilities– including the advanced gliding techniques which were supposedly hot off WayneTech’s workbenches in AC. As usual he neglects to start the evening with the Line Launcher. I think they missed an opportunity, here– it would be interesting to have both Bats and his enemies be rawer and less powerful. 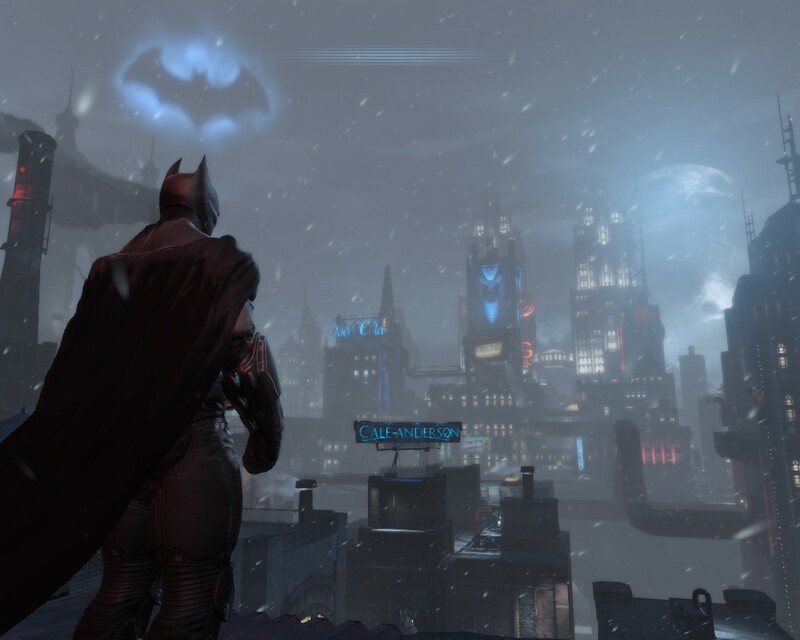 Supposedly one of the DLCs will explore a really early Batman. However, it’s fun to see a more alive, vibrant Gotham City, one not yet transformed into a prison. A lot of the landmarks are there, but there are quite a few changes, too. E.g what was Joker’s territory is still an industrial district. I’m tempted to do some before-and-after shots. The main antagonist so far is Black Mask, which is a little huh? He was a pitiful footnote in AC, and he doesn’t really have the star power, the weirdness, of Joker and Penguin. Ah well, I’m not too far in, we’ll see. Riddler isn’t running the combat maps this time… Batman himself is, in the Batcave. This is actually one of the most disturbing things so far in the game… how do the thugs get there? Does he advertise on Craigslist? Do they find the Batcave somehow, and he keeps them on ice till he’s ready to fight? The idea is brilliant. 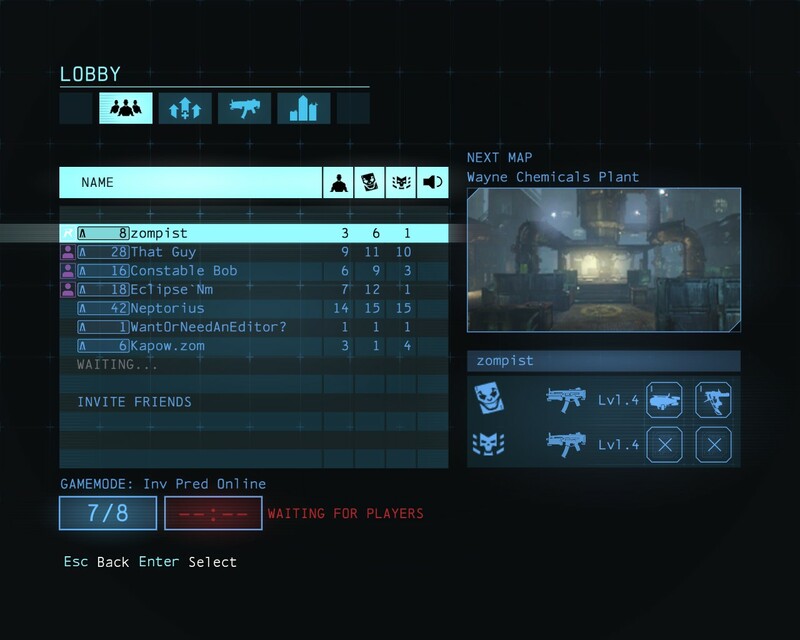 A match consists of three Joker thugs and three Bane thugs, fighting for control over the map. At a point they race to the door and the first one to get there gets to play Joker or Bane himself. The remaining two players play Batman and Robin, so you have a three-way fight. Playing as the thugs is pretty terrifying. You have a version of Detective Vision, but it runs on batteries… that is, you can’t have it on all the time. So you are constantly at risk of being ambushed by the other team and by the heroes. I have a simple, somewhat effective strategy here: keep with the damn leader (normally, the most experienced player on your team). You stand a better chance against all enemies if you keep together in a knot. If you die, you respawn at some random location, which is a huge pain– you’re a sitting duck (well, a running duck) for the heroes. Playing as the heroes is much like playing a predator map– except, of course, that your opponents are real humans, far smarter than the game’s thugs. Plus fewer of the moves are immediate takedowns– a glide kick, for instance, may still allow your victim to evade and shoot back, and it doesn’t take much to get dead. It’s a lot of fun if you’re playing noobs though… they haven’t learned to look up or to stick together. There’s some problems, though, that make me wonder how well it’s going to work. You need exactly 8 players, which can take time. Plus, once you have them, there’s a 40-second countdown, which is plenty of time for people to lose connection, sending you back to that damn lobby. There doesn’t seem to be any skill-matching. The game has been out for two days, and there are already PvP gurus who will mow you down. If that keeps up, it will be pretty impossible for new players very soon. You get various unlocks and damage increases as you get experience– which is also a kick in the nuts to new players. There are “consumables” you can buy with real money. That is, it’s pay to win. I really dislike this, but I don’t know how much it affects the game yet. Maybe everyone will realize it’s a bad idea, and just buy the clothing options. So, it’s a great idea, and it may be ruined by some very poor design decisions. I had some good and bad experiences with it tonight, so I’m still trying it. Plus you can play a match with friends… so, friends, go buy the game already. Edit: Thoughts on finishing the game here. On the book: I’ve been revising based on readers’ reactions. Plus this weekend I added a bunch of German etymologies. I have to say, if German was a conlang, I’d have to say the lexicon creator had his head together. Lots of straightforward etymologies and calques. To put it another way, English is an outlier in how divergent the common and learned vocabularies are. I’ve been learning how to do lots of things in Blender and Unity. Tonight’s big deal was learning how to do bump maps. I’ve applied one to the wall above. Note how the bricks look in the light: the ones at the base of the wall are lit from above, the ones near the top are lit from below. And yet it’s a completely flat texture. That’s the magic of bump maps. They’re an extra texture that gives height information, which the lighting model can use to respond to the entirely nonexistent bumps and hollows of the wall. I wasted several hours trying to do the bump map in Blender, before learning that Blender only handles bump maps in render mode– and I’m not rendering there. Fortunately it’s 1000% easier to do in Unity. You can also see some of the other stuff I’ve been working on, including a working door and chest. 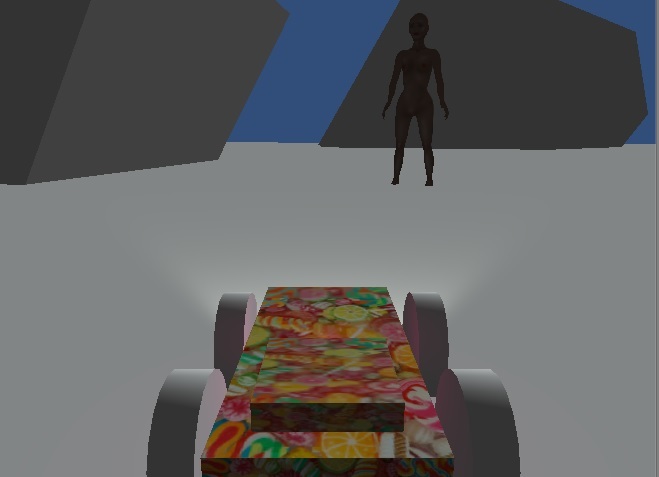 Each object requires a UV map, which tells the program how to map a square texture onto a 3-d model. It’s tedious, but it makes for beautiful in-game resources. And as promised, I made some clothes for the girl. To make them work with the animations, they have to be keyed to the skeleton just as the body is… which is fine except that her body pokes through the clothes in extreme poses. Probably the way to solve this is to make parts of the body into separate meshes that can be disabled. So far I’m impressed with Unity. It’s not always easy, and I wouldn’t recommend it to anyone who didn’t know how to program. 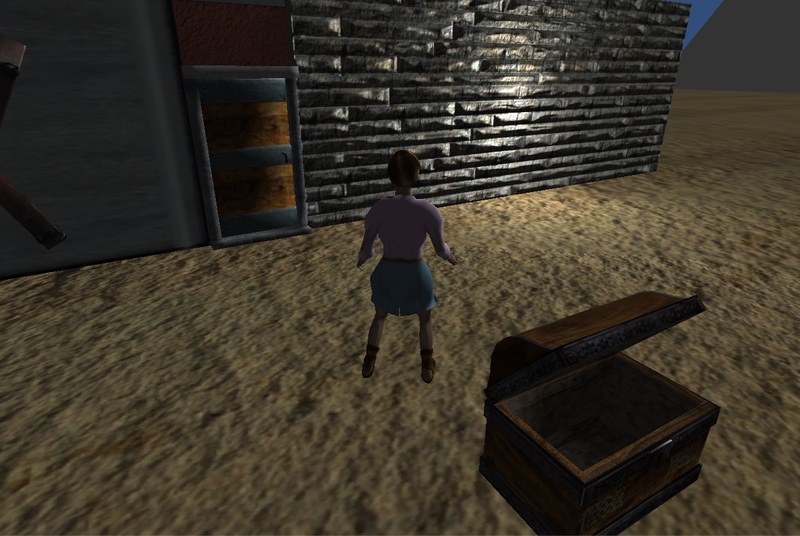 But it handles all the base mechanics of a 3-d world for you– rendering, collisions, lighting, animation, UI, etc. So you can operate on a higher level, putting your world together and making the avatar do stuff. The one big lack is cross-object texturing, something Hammer is very good at. So it looks like the actual room construction will have to be done in Blender. In less than six hours from the time I type this, if Congress cannot get its act together (which at this point is seeming certain), the goverment will go into shutdown. What do you think will happen next, both immediately and over the next few election cycles? Do you think the GOP will have the cojones to force default? In brief, get ready for doom. The Republicans apparently didn’t watch Saturday morning cartoons, so they never saw Schoolhouse Rock and never learned how a bill gets passed. So they’ve had the crazy idea that whatever they pass in the House will somehow become law— thus the 40 motions to repeal Obamacare. And then, because they can never get crazy enough, they got it into their heads that the Senate and Obama would go along with an attempt to get rid of Obamacare— after they lost the election and lost the Supreme Court case. The shutdown, stupid and nasty and wasteful as it is, is nothing to the next bit: defaulting on the debt, which comes in about two weeks. Again, they’ve convinced themselves that they have leverage— that they can get Obama to enact Mitt Romney’s entire agenda, and more, in return for… nothing. The thing is, when you ask for the moon, you have to be willing to provide something in return. And “not kill the economy” is not providing something. Defaulting on the US government’s obligations would be a suicidal move that would bring back another recession, or worse. Needless to say, it doesn’t bring about the beautiful libertarian dystopia they dream of. It doesn’t even get rid of Obamacare— that’s classified as an entitlement, like Social Security, which is why it’s continuing now during the shutdown. For five years, anytime they’ve actually wanted to negotiate, Obama’s office door has been open. Too open, really. But to negotiate you have to be willing to give the other side some of what it wants, and for five years they’ve thought that they could skip this part. In 2011 Obama was eager for a long-term deficit-reducing deal, so he stupidly made some concessions on the debt ceiling thing. That only emboldens the GOP now. Obama seems to have wised up; he says he won’t offer any concessions in return for Congress doing its job. And he has said, correctly, that if he gives in on this, it’s the end of majority government in this country. They’d just increase their demands with each debt crisis. And why would a future Democratic House play nice with a future Republican president? So, will they do it? I’m afraid they will. They’re revolutionaries and nihilists; they don’t care what happens. No one they care about is telling them not to do it. The problem is, they have no exit strategy. Boehner is terrified of losing his job, so he went along with a plan he knew wouldn’t work. The Tea Party has worked itself into such a lather that it’s not going to go quickly to any sort of reasonable solution. Normally at this point, you’d expect the grownups to step in and tell them to cool it. But they’ve spent the last twenty years throwing out the grownups— there’s a moderate caucus, but it hasn’t even got the 25 votes required to get a vote on the Senate bill. The more moderate national figures like McCain and Romney, who think the defunding moves are a terrible idea, have no influence on the House. The money guys— Wall Street, the 1%— is going to get terrified at some point. Most of them are not crazed Tea Partiers— they don’t want to trash the government or destroy its credit rating. But they have very little leverage with the Tea Party either. If they lean on anyone, it’ll be John Boehner— and Boehner can’t control his own party. Now, the last few crises have ended with a deal at, or a few days after, the deadline. So the most likely case is that around Oct. 20, a deal come through that keeps spending levels about where they are, funds Obamacare, raises the debt ceiling, and contains some kind of sweetener so Boehner can claim victory. At any point Boehner could end the crisis by allowing a vote on the Senate bill. But he’d face a Tea Party revolt, so he’s not going to put his job on the line for a continuing resolution. For a deal that punts the problem for another year, maybe. The worse case, and a series of steadily worsening cases, is that it takes the House a couple months after shutdown and default to realize that they’re not getting anything, and then they make a deal. The Democrats, of course, are betting that the country will (very rightly) blame the GOP for the crisis, and for any pain that results. So far they’ve been very firm; it’s the GOP that’s showing itself full of holes. Andrew Sullivan’s blog, the Dish, is good for getting a handle on what all the pundits are saying. Crazier scenarios than the ones I’ve outlined are possible, and no one knows what will happen, except that it’ll be bad. In the long term, as I’ve said before, demographics are against the GOP… to mention just one state, Texas may well go back to the Democratic column within ten years. Relying exclusively on old white rural straight Christian non-Northerners is a losing strategy, if not in 2016, definitely in 2026. The problem is, again, the craziness has no exit strategy. There is no mechanism for moderation in the party— quite the reverse, the primary system (and the very well-organized grassroots) keeps dragging the party more to the right. The public and the media may be pissed at the House Republicans right now— but their districts aren’t rebelling. Juan Linz, who died yesterday, was a political theorist who mostly studied Latin America; his major thesis was that presidential systems just don’t work as well as parliamentary systems— because they have multiple concentrations of power each with electoral legitimacy, and there is no way to end the standoff. For years the major challenge to his theory was the two-century history of the US. It’s beginning to look like Linz was right after all. He suggested that the US avoided the trap because its parties were broad coalitions, too loose to create real gridlock. Well, the GOP has spent thirty years becoming an ideological monolith dedicated to opposing the Democrats at all costs. So the worst case is, the GOP causes a depression and forces a collapse of the American governmental system. Importing Blender characters and animations into Unity is supposed to be easy. Getting there is pretty horrific, though. As usual, nothing will work right away; you have to look at a million forum pages and tutorials, and swear a lot. One fun complication: both programs keep overhauling themselves, so half the time a method suggested in a tutorial won’t work in your version. And then there was the evening my Blender file got corrupted, giving me a distorted figure I couldn’t fix. That woman is bigger than my first car! I need to go look at more Blender tutorials now, because I’m sure I’m doing the animation wrong. There’s got to be an easier way to repeat a pose, rather than copying bone positions one at a time. She lost her hair, because my earlier save didn’t have it. 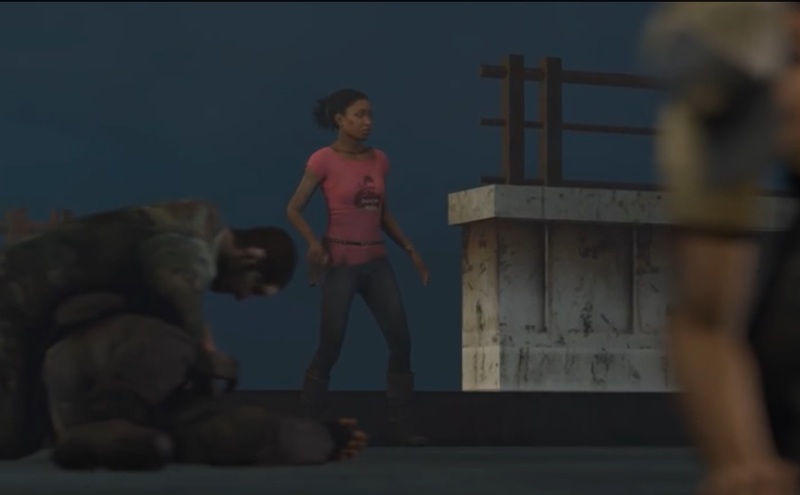 Unity wasn’t always getting her hair anyway– one more thing to check into soon. I’m scared of the Actions tab in Blender now. I was messing with that when my figure got corrupted. So I’m just doing one long animation, and breaking it up in Unity. Unity can read Blender files, so you can just put a copy of the file in your Assets folder, then import it. Key bit: you can click on the asset again to change the import settings. Unity has two animation systems… the tutorial for using one of them has about 50 steps. Instead of doing that, I used the old system; the key bit is setting the Rig type in the import inspector to Legacy. I spent about two evenings trying to get the animations to play, and it just wouldn’t do it. But using the simpler figure, long animations in Blender, legacy mode in Unity, it worked this time. Now I even have two animations!